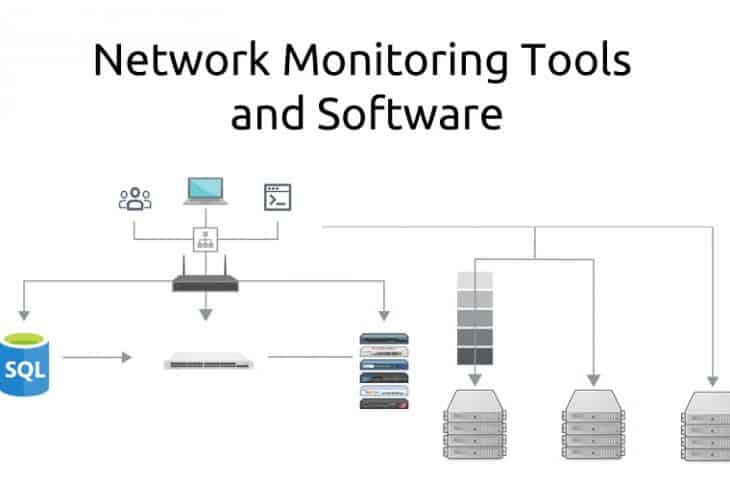 10 Best Network Monitoring Tools & Software of 2019 | FREE - UPDATED! The realm of Network Monitoring Tools, Software and Vendors is Huge, to say the least. New software, tools and utilities are being launched almost every year to compete in an ever changing marketplace of IT monitoring and server monitoring. We've gone through as many tools as we could find and rounded up the best ones in easy to read format and highlighted their main strengths and why we think they are in the top class of tools to use in your IT infrastructure and business. 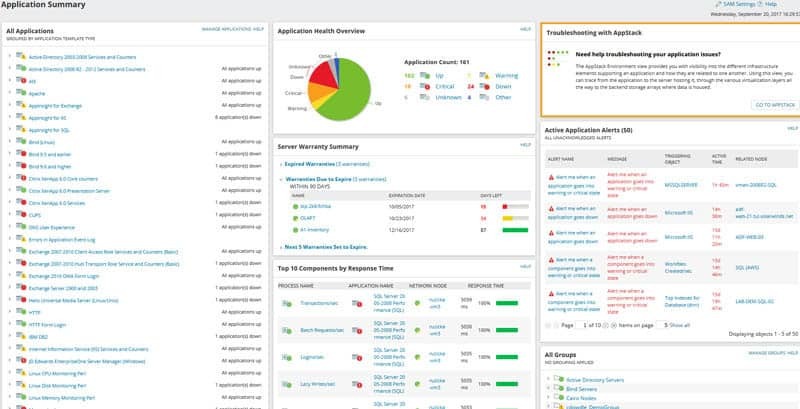 Some of the features we are looking for are Uptime/Downtime indicators, along with a robust and thorough alerting systems (via Email/SMS), custom templates and thresholds, Netflow and SNMP Integration, Automatic Network Topology Discovery and Mapping functionality, and much more. The features from above were all major points of interest when evaluating software suites for this article and we'll try to keep this article as updated as possible with new feature sets and improvements as they are released, as newer versions of the tools below will likely be released throughout the years. Below you'll find an Updated list of the Latest Tools & Software to ensure your network is continously tracked and monitored at all times of the day to ensure the highest up-times possible. Most of them have free Downloads or Trials to get you started for 15 to 30 days to ensure it meets your requirements. SolarWinds Network Performance Monitor is easy to setup and can be ready in no time. The tool automatically discovers network devices and deploys within an hour. Its simple approach to oversee an entire network makes it one of the easiest to use and most intuitive user interfaces. The product is highly customizable and the interface is easy to manage and change very quickly. 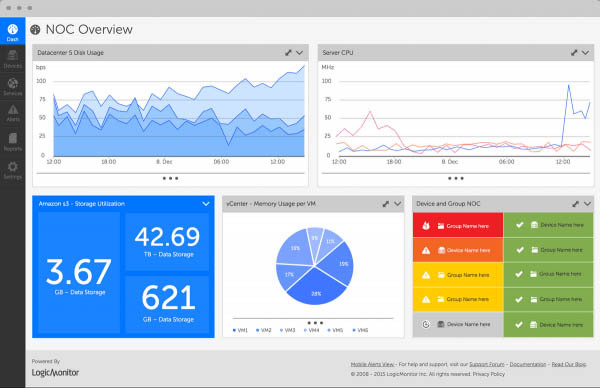 You can customize the web-based performance dashboards, charts, and views. You can design a tailored topology for your entire network infrastructure. You can also create customized dependency-aware intelligent alerts and much more. The software is sold by separate modules based on what you use. SolarWinds Network Performance Monitor Price starts from $1,995 and is a one-time license including 1st-year maintenance. 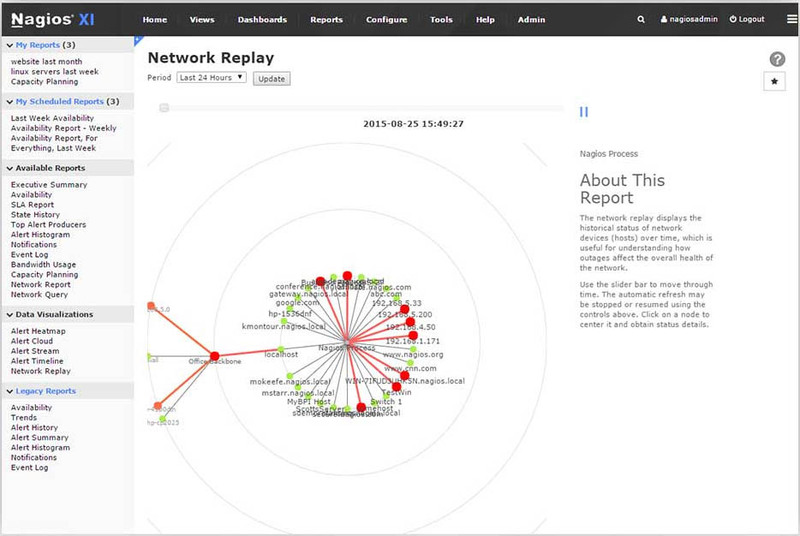 Monitor CISCO ASA networks with their New Network Insight™ for CISCO ASA. Monitor Hardware Health of all Servers, Firewalls, Routers, Switches, Desktops, laptops and more. PRTG Network Monitor software is commonly known for its advanced infrastructure management capabilities. 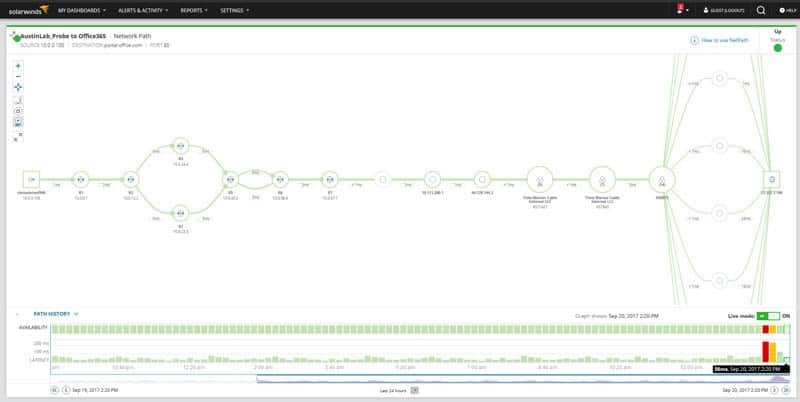 All devices, systems, traffic, and applications in your network can be easily displayed in a hierarchical view that summarizes performance and alerts. PRTG monitors IT infrastructure using technology such as SNMP, WMI, SSH, Flows/Packet Sniffing, HTTP requests, REST APIs, Pings, SQL and a lot more. It is one of the best choices for organizations with low experience in network monitoring. The user interface is really powerful and very easy to use. A very particular feature of PRTG is its ability to monitor devices in the datacenter with a mobile app. A QR code that corresponds to the sensor is printed out and attached to the physical hardware. The mobile app is used to scan the code and a summary of the device is displayed on the mobile screen. PRTG has a very flexible pricing plan, to get an idea visit their official pricing webpage below. Free Download up to 50 Sensors! 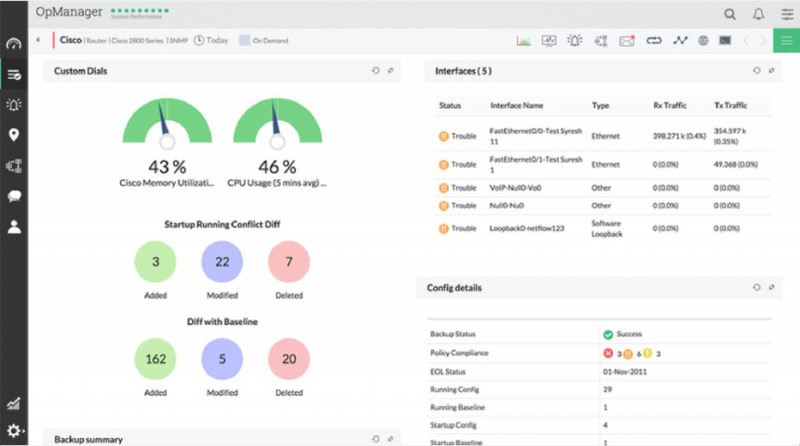 At its core, ManageEngine OpManager is an infrastructure management, network monitoring and Application Performance Management “APM” (with APM plug-in) software. The product is well balanced when it comes to monitoring and analysis features. The solution can manage your network, servers, network configuration and fault & performance; It can also analyze your network traffic. To run Manage Engine OpManager, it must be installed on-premises. A highlight of this product is that it comes with pre-configured network monitor device templates. These contain pre-defined monitoring parameters and intervals for specific device types. The essential edition product can be purchased for $595 which allows up to 25 devices. WhatsUp Gold (WUG) is a network monitoring software from Ipswitch. It is one of the easiest to use and highly configurable tools in the market. 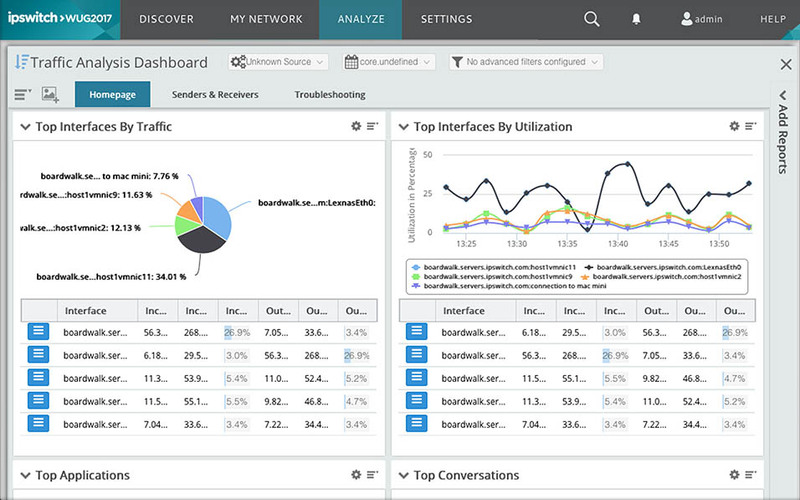 The dashboards are user-friendly and visually attractive. 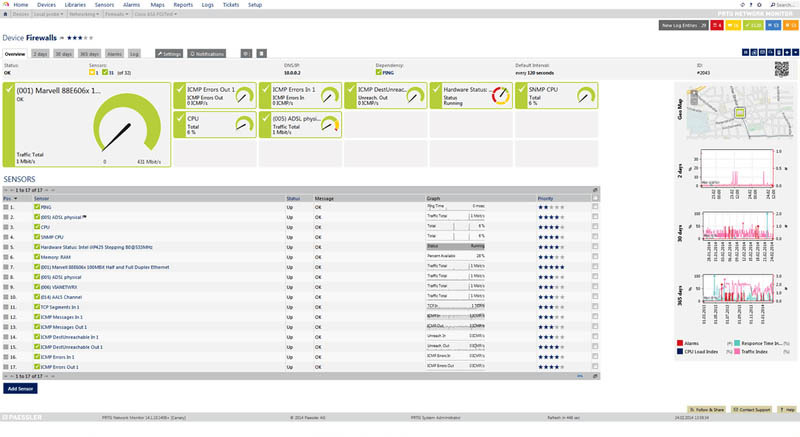 For daily IT management, WhatsUp Gold is a price/feature balanced network monitoring tool. It is also completely customizable. 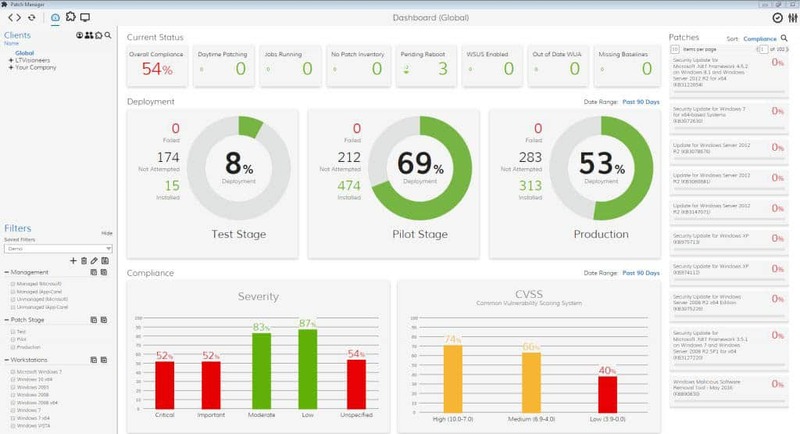 Dashboards can be customized to display your IT infrastructure and alerts to fit your requirements. The highlights of the newest 2017 Plus version are hybrid cloud monitoring, real-time performance monitoring, automatic and manual failover and extended visibility to distributed networks. WhatsUp Gold is limited for Windows OS support. This software comes with different pricing plans to adjust to your network and wallet. Compare different editions in their official website and ask for a price quote. Nagios XI is aimed at a wide audience, from freelancers, SMBs (Small-to-Medium-Business), to large corporations. This makes Nagios’s XI pricing model one of the most flexible. They have a free version, open-source, one-time license and subscription. It is one of the few tools that allows an extreme flexibility (because of its adaptability to plug-ins) on what’s being monitored and alerted for a low cost. Nagios XI focuses on monitoring. The key IT components that Nagios XI monitors are Network, Infrastructure, and Database. Although the software is easy to install, it will initially take some time to adjust to your requirements. This is because Nagios XI does not auto-discover devices. You have to configure each device that needs to be monitored with a configuration file. Standard paid edition starts from $1,995 for 100 nodes. Nagios XI is supported only by Linux (or UNIX variants) OS. Zabbix is an open source monitoring tool. It is popular for its easy-to-use and pleasing Web GUI that is fully configurable. 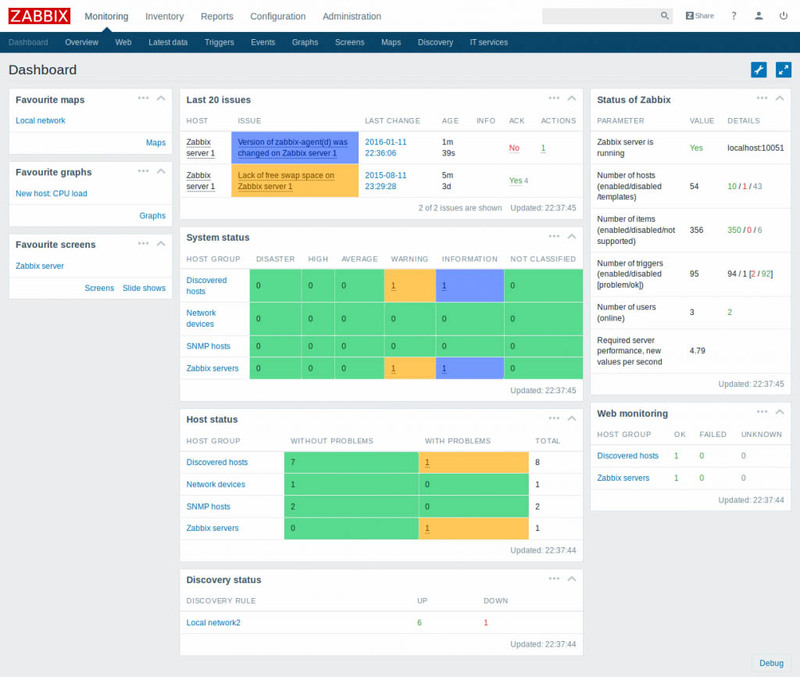 Zabbix focuses on monitoring and trending functionality. This software is frequently used for monitoring servers and network hardware. One of the highlights of Zabbix is that it can predict trends in your traffic. Zabbix can forecast future behavior based on historical data. Since it is open source, it has an active user community spread around the world and good documentation. Zabbix gives the freedom to use the open-source solution without vendor lock-ins (including all components). Zabbix is powerful for SMB networks below 1,000 nodes. Over that, the software can get slower and its performance decreased. Another disadvantage is that it doesn’t include real-time tests and reports. It is another open source infrastructure and service monitoring tool. Icinga was developed in 2009 by the same team of developers that brought you Nagios. It is a very easy to use and flexible tool for SMB and enterprise networks. The software focuses strongly on monitoring infrastructure and services. The tool also includes great threshold analysis and report/alert functionalities. Icinga is popular at providing superior alters and reports of the general health of your IT infrastructure. All alert dependencies can be displayed in the dashboard and sent via email, SMS or mobile message applications. Since Icinga is open source it is completely free. With its strong community forum, you can get all support you need. It is a monitoring service specially designed for hybrid cloud environments. 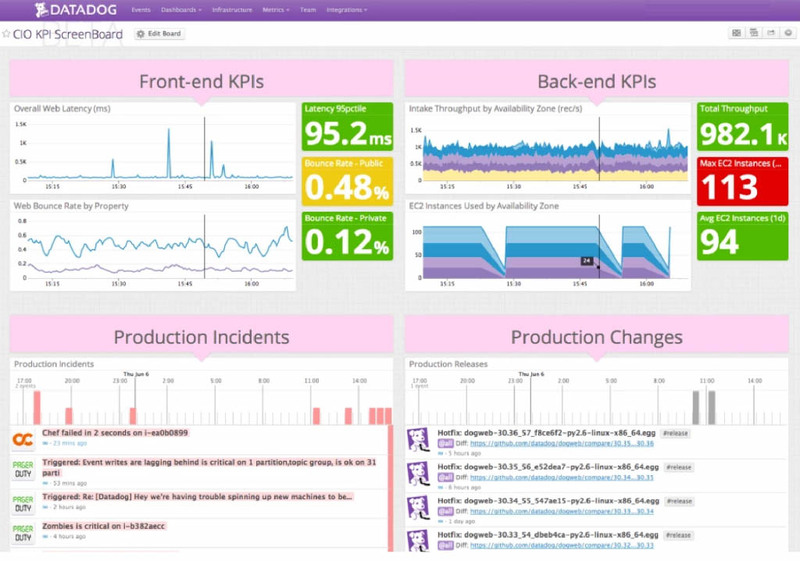 Datadog can also monitor the performance of network, apps, tools, and services. One of the highlights of Datadog is that it can provide extensibility though many APIs (Application Programming Interfaces) with very good documentation. The software is very easy to install and can be up and running in on time. To make it easy, agents can download and install the software. The agents are available for various different platforms such as Windows, Mac OS, Several Linux distributions, Docker, Chef, Puppet, etc. You can create custom graphs, metrics, and alerts in an instant, and the software can adjust them dynamically based on different conditions. Datadog prices start from free (up to five hosts), Pro $15/per host, per month and Enterprise $23 /per host, per month. Formerly known as Labtech, ConnectWise Automate is a new cloud-based manager and monitoring solution that can keep track of your IT infrastructure devices from a single location. ConnectWise Automate discovers all devices in your network so they can be monitored proactively. The network visibility is improved because the tool interprets problems and initiates an automatic pre-defined action to mitigate the issue. A cool feature of this software is the “Patch Management”, as it allows you to protect all your systems with simultaneous patching from a centralized manager. Use Windows Patch management or third-party software. By extending the ConnectWise suite, the software can also allow a premier remote control. You can resolve issues quickly by allowing remote support, remote access and even remote meetings. ConnectWise Automate is aimed at SMBs. The price of the software is based on quotes. You can get a price on their official site tailored accordingly to the size of your network. 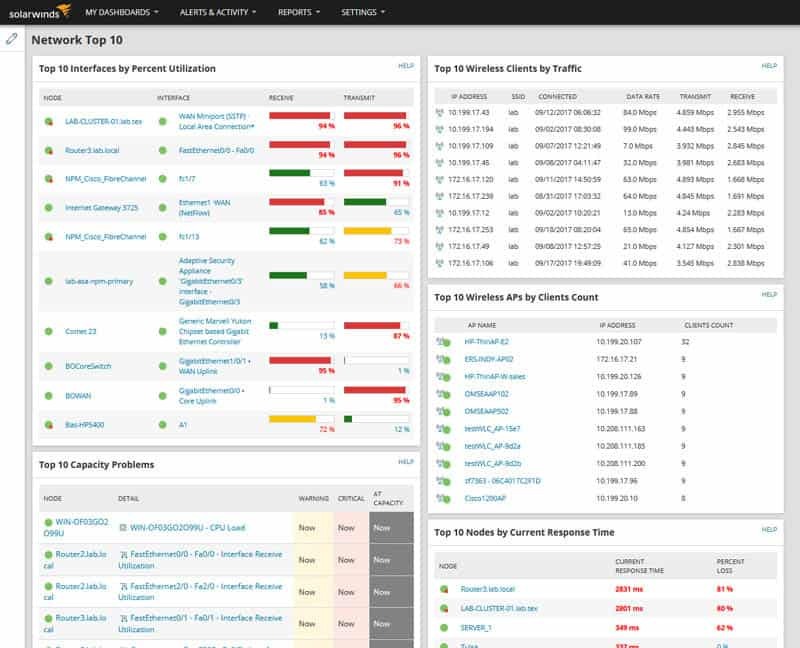 LogicMonitor is an automated SaaS (Software-as-a-Service) IT performance monitoring tool. With LogicMonitor you can get full visibility of the performance and health of your network. This software will automatically discover IT infrastructure devices and monitor them proactively. Besides from extraordinary monitoring capabilites, the software also improves the performance and health of your network. LogicMonitor can help identify incoming issues by providing predictive alters and trend analysis. 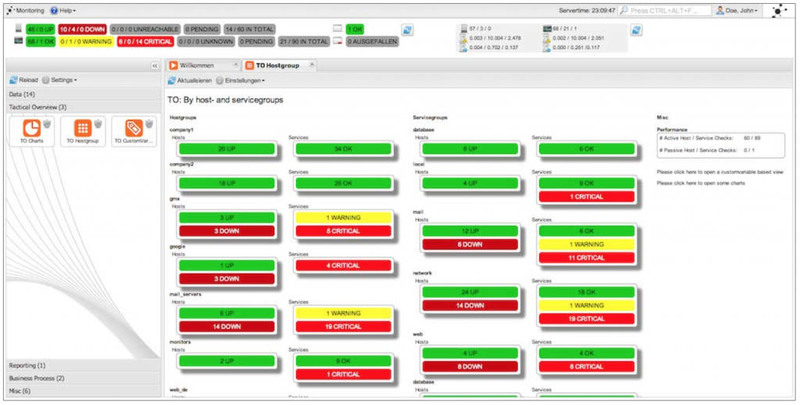 Logic Monitor is popular because it comes with a highly customizable dashboard, alerts, and reports. The software supports over 1000 different technologies, including hybrid cloud and networking devices, in order to provide granular performance metrics. To get a price you can request a quote from LogicMonitor’s official pricing site. OP5 Monitor is OP5’s Enterprise level monitoring solution. 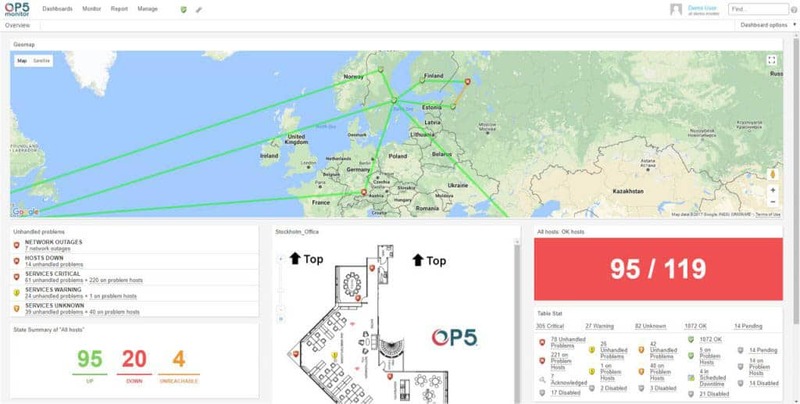 With OP5 Monitor you can monitor applications, networks, servers and storage, regardless of location, whether that’s on-premise, hybrid or in a private/public cloud. OP5 Monitor is also Nagios compatible, meaning that it’s easy to migrate from Nagios and re-use existing agents and plugins. Reporting – Custom, SLA- reports and availability reports. OP5 Monitor is free for up to 20 devices, and has a pricing plan based on your specific requirements.